Yesterday was a rough day at the Inn, the staff team received some bad news and still had to continue to work through a very busy day. 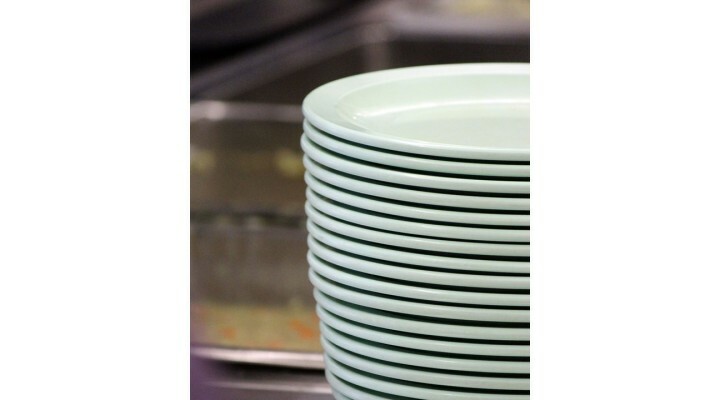 We usually see the number of meals served grow and decline in a predictable way as paydays come and go, but even though Wednesday was quieter, Thursday was busy again with about 800 meals served. As the end of the day approached, and the staff team was preparing for an emergency meeting, we felt the support of the family of guests who expressed their concern throughout the day, but significantly we also felt supported by the community through the volunteers and fine option workers who happened to the be the ones working alongside the staff. A group of high school students worked hard with us and expressed their empathy. The people working off fines and community service stepped up to do the jobs they had been learning happen every day. Most of all, the team of volunteers who came from Shaw Cable for their monthly volunteering went above and beyond to help us get cleaned up after the long day. They came in their blue Shaw shirts, helped in the busy dining room throughout lunch and then stayed longer that required to sweep and mop, freeing up the staff for our meeting so we could deal with our family business. Thank you so much Shaw team and all the volunteers for being family to us when those who help needed support!